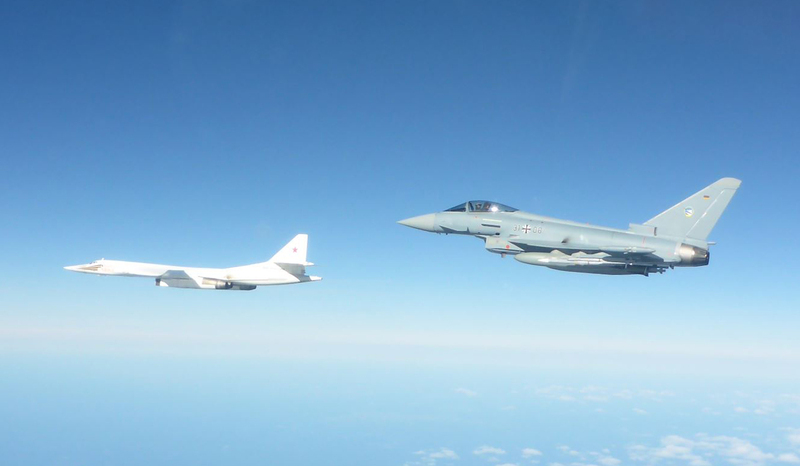 NATO fighters remain busy in the Baltic, responding to provocative Russian air force flights that “cut the corner,” clipping NATO airspace as they transit to and from the Kaliningrad Oblast enclave, or as they exercise in the Baltic. To illustrate the high levels of recent Russian activity, live “Alpha” scrambles by NATO QRA (Quick Reaction Alert) aircraft on the Baltic Air Policing mission went from 46 in 2013 to 138 in 2014, and reached a high of 153 in 2015. NATO fighters scrambled 130 times in 2017, and 85 Alpha Scrambles had been mounted by mid-November 2018, including 12 by pairs of Belgian F-16s and 16 by pairs of Luftwaffe Typhoons since they took over the rotational commitments in Lithuania and Estonia at the end of August. The day after AIN’s visit to Amari Air Base, Luftwaffe Typhoons scrambled three times to intercept four Russian military aircraft, including a MiG-29UB, an Antonov An-26, and two Ilyushin Il-76 transports. Since Russia’s invasion of eastern Ukraine in 2014, NATO has embraced a new Readiness Action Plan (RAP) aimed at ensuring that the Alliance is ready to respond swiftly and firmly to new security challenges on its borders. Key to this is an increased military presence along the borders of the Alliance to reassure allies and deter potential aggressors. In particular, NATO has mounted what it calls an “enhanced forward presence” close to Russia’s Western border, in the Baltic States, and in Poland. Patrol activity by NATO ships was stepped up in the Baltic Sea, while on the ground more than 4,500 troops were deployed in a U.S.-led battle-group in Poland, a German-led battlegroup in Lithuania, a British-led group in Estonia, and a Canadian-led formation in Latvia. In the air, NATO’s long-standing Baltic Air Policing commitment was quietly doubled, and the rotational QRA deployment at Lithuania's First Air Force Base in Zokniai/Šiauliai International Airport was augmented by a second deployment at Amari Air Base in Estonia. Typically, four fighters are deployed to each base, where two are maintained on QRA, ready to scramble to ensure and protect the integrity of NATO airspace. During the summer months, a second deployment is maintained at Šiauliai by a so-called "augmentation nation." The Baltic Air Policing mission originally began in March 2004 when the Baltic States joined NATO, because alliance members that lack an adequate air policing capability of their own may be assisted by other NATO members, operating on the principle of collective defense that underpins the alliance. There are formal agreements to ensure that a standard level of airspace security is maintained within SACEUR’s area of responsibility. Although the Baltic States (such as Albania, Iceland, Luxembourg, and Slovenia) do not have their own fighter aircraft, they contribute towards the cost of allied deployments, and their national aerial surveillance and air traffic management systems are used—with a Control and Reporting Centre in each of the Baltic States controlling the fighter operations. The mission is carried out under the NATO Integrated Air and Missile Defence System under the oversight of Allied Air Command. Baltic Air Policing missions are executed by the Combined Air Operations Centre at Uedem, Germany, which initiates all scrambles by the QRA (Intercept) fighters at Šiauliai and Amari. QRA(I) aircraft are scrambled in response to intrusions or potential intrusions into allied airspace, or when military or civilian aircraft are in distress or fail to follow international flight regulations by not properly identifying themselves, not communicating with air traffic control, or not filing flight plans.